There is, indeed, steam rising off the pond in the background of this selfie. It’s boiling water. People used to cook eggs here but Taipei City put up fences, both for preservation and to stop people from accidentally cooking themselves. 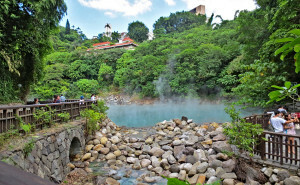 This is a volcanic crater known as the Beitou Geothermal Valley（地熱谷); or sometimes, Hell Valley; or also, Jade Springs Valley. It’s not the temperature that makes it unique. The mineral composition of this spring, which gives it the lovely jade color, is only found in two locations in the world. The water, besides being highly acidic and containing radium and sulfur, has a high concentration of chlorinated sulfate minerals. Over the course of many centuries, this crystallizes into the rare mineral hokutolite. 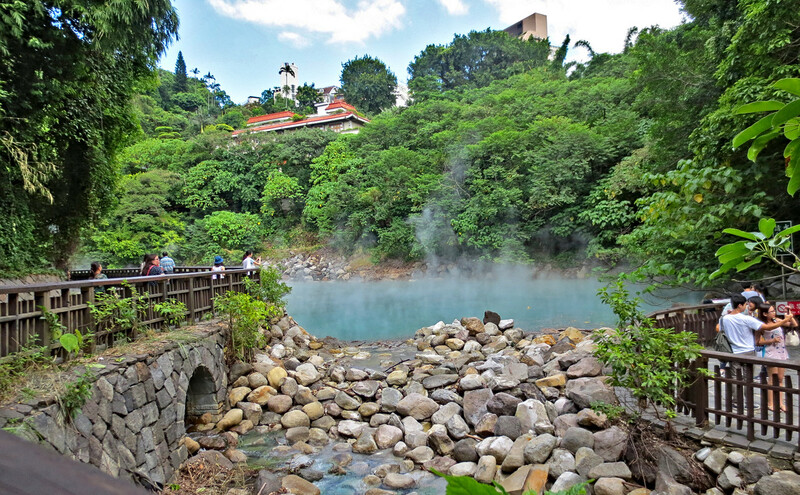 Sadly, hokutolite stones have been harvested over the years and, now, one can only see the stones at the nearby Beitou Hot Spring Museum. Downstream from the headwaters are many hot springs hotels, condominiums and spas. 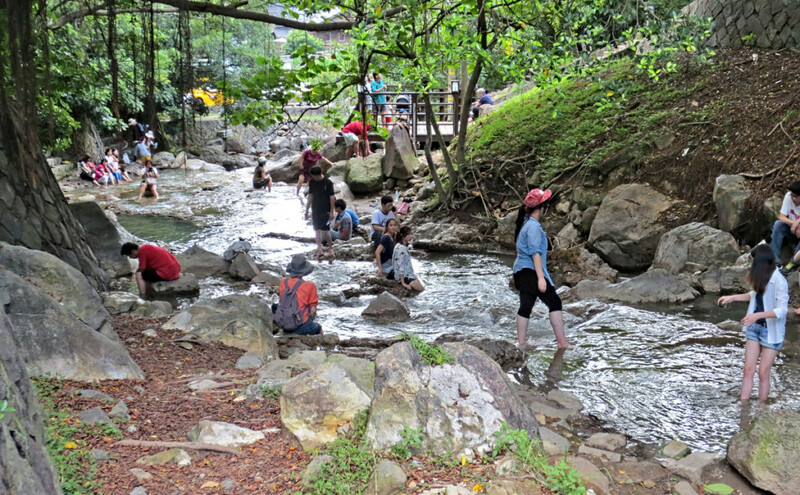 There is also a foot bath with this beautiful jade water near the Beitou Park. Of course, the stream itself is public park land and you’re welcome to get in anywhere convenient. We took off our shoes and put our feet in near the top of the stream. It was still too hot! Previous PostSame But DifferentNext PostCan You Say Neighborhood? 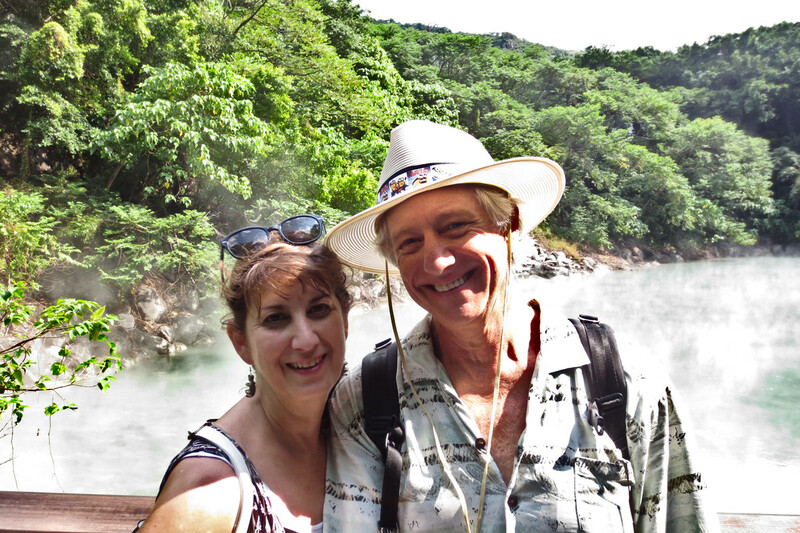 What we get from this adventure is just sheer joy. And joy is, after all, the end of life. We do not live to eat and make money. We eat and make money to be able to enjoy life. That is what life means and what life is for.